Global Phytosterols market size is forecast to surpass USD 1 billion by the end of 2024 as a result of its wide applications in pharmaceuticals, cosmetics, and food ingredients. Growing cases of heart ailments and cancer are predicted to propel the market demand. Rising health consciousness leading to healthy food habits among consumers is expected to promote the industry growth trends. FDA, EFSA and Health Canada approval of Phytosterols application in the food & dietary supplements owing to its cholesterol reducing feature is further anticipated to contribute towards the market growth. 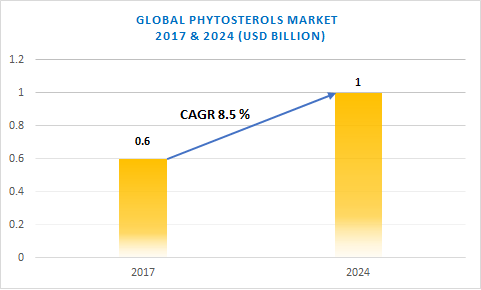 Phytosterols industry size worth USD 600 million in 2017, is forecast to grow at a CAGR of 8.5% over the period of 2018-2024.The rising trend towards food fortified ingredients with high nutrition contents and low calorie levels in food & beverages are predicted to drive the industry growth. Their use/application as additives in food items such as yoghurts, milk, sauces, and bakery items owing to the growing health awareness among the consumers will benefit the market. However, the substitute threat from Omega 3 ingredients with favorable features such as heart rate regulation, cancer risk reduction and improvement in brain functions can inhibit the growth of Phytosterols market. Furthermore, inadequate supply of vegetable oils and tall oils which are the rich sources of Phytosterols will impact the market price trend. Phytosterols market is segmented in terms of applications, products, and regions. Campesterol Phytosterols market is anticipated to record a CAGR of around 8.5% over the forecast timeline. Its use in food/dietary supplements and medicines for reducing cholesterol levels is predicted to fuel the product demand. Beta-Sitosterol Phytosterols market worth over USD 390 million in 2017, is predicted to record a CAGR of around 9% over the forecast timeframe. The increasing occurrence of heart diseases along with heavy government support is projected to add towards the market growth. Pharmaceuticals segment is projected to grow at a rate of around 9% over the period of 2018-2024. Adverse health effects as a result of consumption of prescribed traditional medicines will stimulate the demand for Phytosterols. In addition to this, it is used in drug formulation for curing heart disease due to cardioprotective effect. Food ingredients segment worth over USD 300 million in 2017, is anticipated to exceed USD 540 million revenue by the end of 2024. Fortified food ingredients possessing/having low calorie levels and high nutritional value are predicted to drive the Phytosterols demand in food & beverages industry. Phytosterols are used for providing UV protection and enhancing skin elasticity in cosmetics applications owing to its anti-inflammatory property. Increasing consumer consciousness about skincare is predicted to promote its demand in cosmetics applications. Europe Phytosterols market is projected to exceed USD 450 million by the end of 2024. Germany, Poland, Italy, and UK markets are predicted to contribute significantly towards the regional growth. 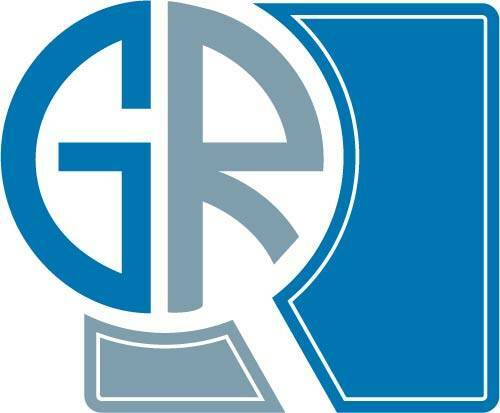 Latin America market is predicted to grow significantly over the next eight years, with Brazil Phytosterols market size predicted to exceed USD 30 million by end of 2024, recording a CAGR of around 8% over 2018-2024. U.S. Phytosterols market is predicted to grow at a rate of around 8.5% over the forecast timeframe as a result of the rising occurrence of heart and cancer ailments boosting the product demand. Japan, India, and China are predicted to contribute significantly towards the Asia Pacific Phytosterols market growth over the forecast period. The increasing significance of dietary supplements coupled with favorable government policies to promote foreign investments in pharmaceutical and food & beverage sectors will stimulate product demand. Key industry participants include PrimaPharm, Eugene Science, BASF Cognis, DuPont, and Cargill.